Location Fremington Edge. Fell End Scar. 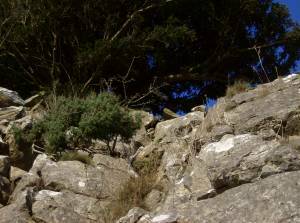 Geology Sheer cliff formed by the Main Limestone with chert strata over. Scree slope and kame terrace below. Record Description Very large and ancient yews on highly exposed west facing limestone scar and at top of the scree slope below with single juniper, rowan and hawthorn. The solitary gooseberry bush here may be the highest record for this species in Britain, the previous highest record for gooseberry (Ribes uva-crispa)was on Ingleborough at 380m. Ref: Pearmain, D. A. and Corneer, R.W.M. 2003. 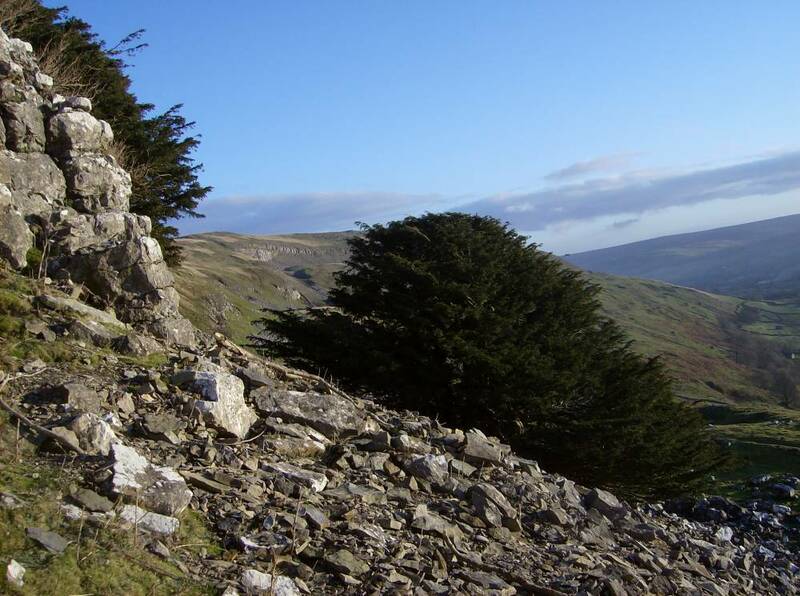 Altitudinal Limits of British and Irish Vascular Plants. BSBI. 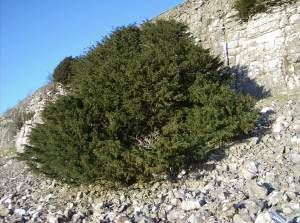 Additional Notes The largest of the Yews, The Main Yew,a female, see photos, grows at the top of the scree. This fine yew measures 7.1m at the base and has a total of nine stems (trunks) which meet the base of the tree below the level of the scree. 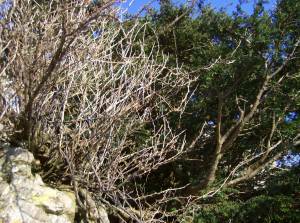 Several of the yews on the face of the cliff are also very large and ancient. 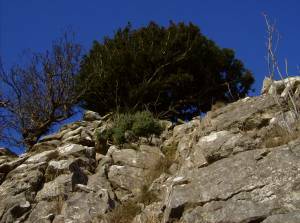 A total of nine ring ouzels have been seen to be feeding on the berries of these yews during the autumn. Image 1 Description Fell end Scar. 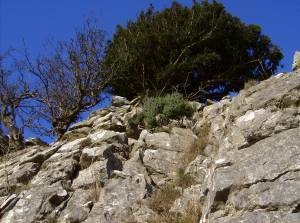 Limestone with yew, juniper and blue sky. Image 2 Description Fell End Scar. From the upper kame terrace east of the Hindrake Vein. Image 4 Description The Main Yew. View eastward. Image 5 Description The Main Yew with small elder. 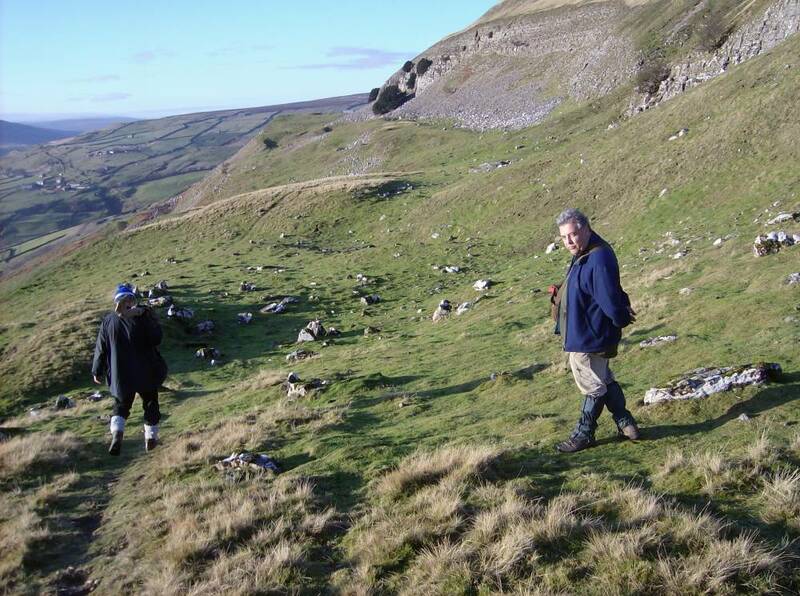 Limestone cliff with chert strata over. 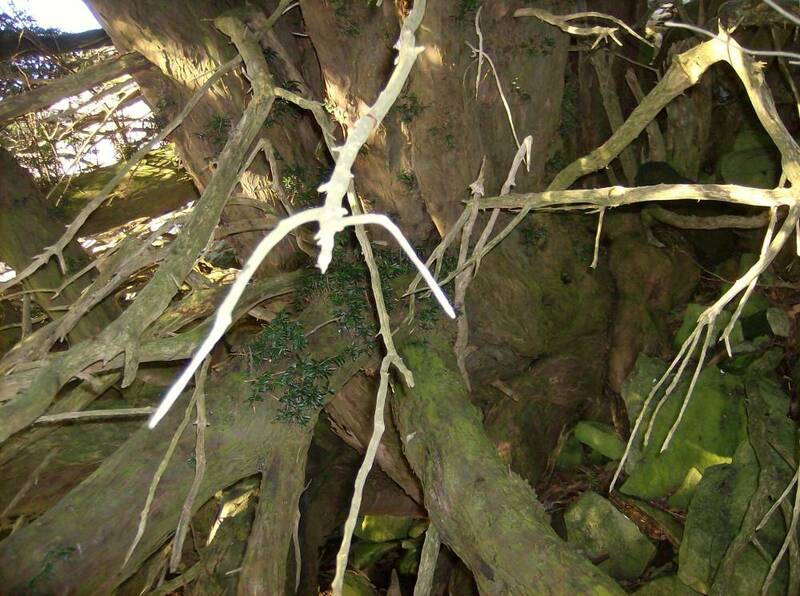 Image 6 Description The Main Yew. Detail. Image 7 Description Yew at top edge of limestone cliff, with juniper on face of Scar. Image 8 Description Juniper. 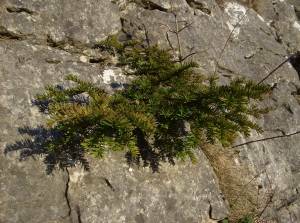 Single bush on face of cliff with multistemmed yew at top of cliff. Image 9 Description The Fell End Gooseberry. 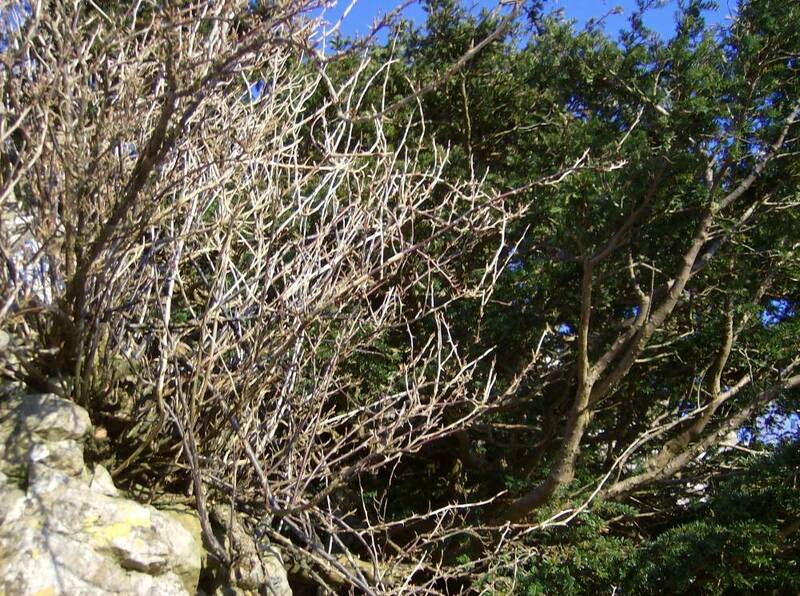 Highest record in Britain for gooseberry (Ribes uva-crispa). 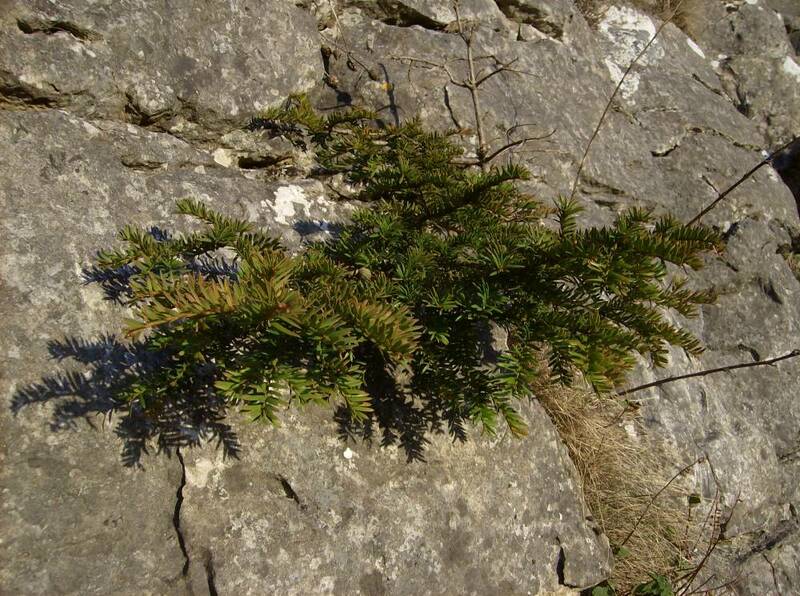 Image 10 Description Young yew on face of the cliff. The next generation.